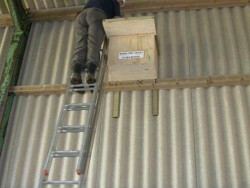 Finding the best position for your nestbox may make all the difference to whether Barn Owls will occupy it or not. 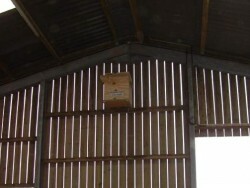 Barn Owls look for holes at least 3m from the ground. 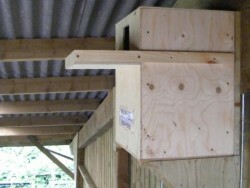 Is your barn or building suitable for a nestbox? Where to put a tree box. 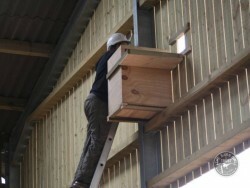 In a VERY big building the side wall may be high enough for a nestbox. Usually, an end wall is a good high position. The minimum recommended height is 3 metres above ground level. 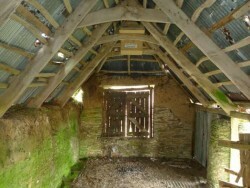 Most old barns do not have a suitable nesting place unless a box is erected. 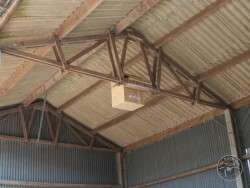 In a 2-storey building, aim for 3 metres above upper-floor level. Face the box towards the most likely owl entrance hole. 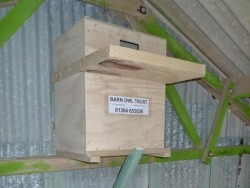 Or face the box towards where you think the owl will perch when it flies in. Positioning above a doorway is fine. 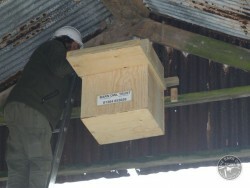 It’s important to not hide the nestbox entrance hole. You want a visiting owl to see it. Sometimes an owl hole should be created. Especially if the building has owl-proof doors. 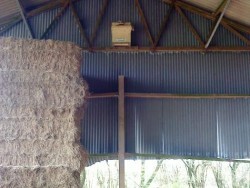 Avoid positions where the box might be hit when bales are stacked. If fixing against slatted walls, choose the driest end of the building (not west-facing). 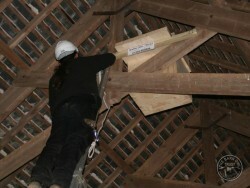 In this loft, the box was adapted to fit up against the entrance hole. 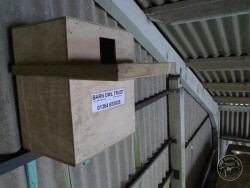 Openings and holes to attract Barn Owls. 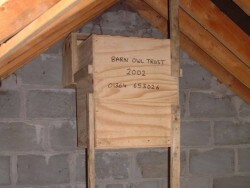 Barn Owl nestboxes for inside buildings. 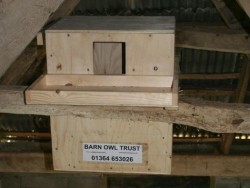 Buy an indoor Barn Owl nestbox.